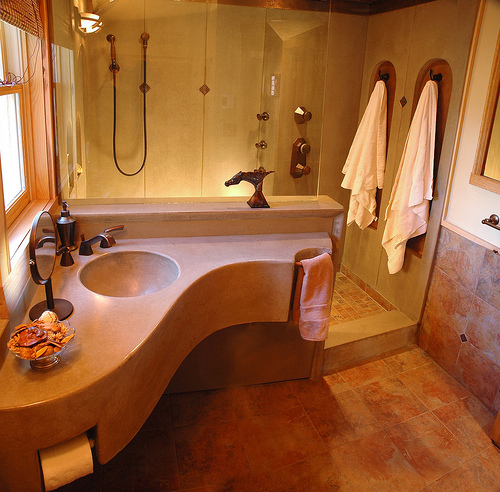 Renovating your old bathroom is a fantastic way to improve your home and bring new life into your property. However, a bathroom renovation does not necessarily mean a complete overhaul of bathroom furniture and a new bathroom suite. There are in fact far easier and far less expensive ways of renovating your bathroom to provide a modern and stylish look. 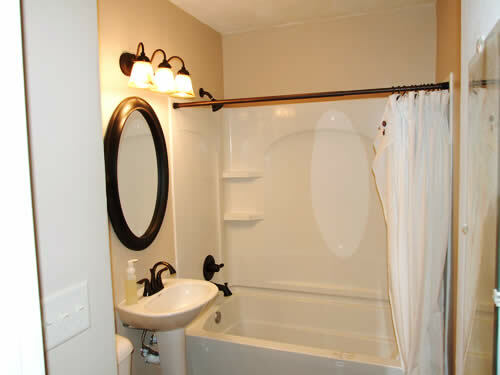 By far the easiest way redecorate a bathroom is by repainting it. Whether you change the colour of your bathroom or stay with the same tonal scheme, this is an incredibly effective way of making your bathroom look both stylish and modern. Because of the amount of moisture frequently present within a bathroom, paint begins to fade quickly and can even begin to look crumbly and grimy. Redecorating the walls and the floors regularly will increase the life of your bathroom and prevent it from looking old and tired. Wooden furnishings look great in a bathroom but over time they can begin to look tired. One easy way of revitalising these furnishings is by simply sanding them down to remove the surface layer of wood and then treat them with either a varnish, polish or paint, depending on how you want them to complement the other colours in the room. When decorating a bathroom, very few people realise what an ideal space it makes for accessorising and adding ornamentation. The bathroom is often regarded as a minimalist space in which clutter and evidence of your personal taste should be avoided. On the contrary, the bathroom should be a space in which you are able to be creative and introduce your own personal character. You will find that when it comes to bathroom accessories UK suppliers have a wide range of subtle products which add character and flavour to your bathroom. When you are looking to adapt your bathroom, think about accessories such as bath mats which complement the colour scheme of the bathroom. Soap dishes, toilet roll dispensers and toothbrush holders can all be chosen selectively to enhance the look of the room. Personal ornaments such as paintings and family photos can also be a great way of adding your own character to the bathroom. Buying an entirely new bathroom suite is often unnecessary. Often when people are renovating a bathroom, the temptation is to dive in straightaway and buy an entirely new and expensive bathroom suite. 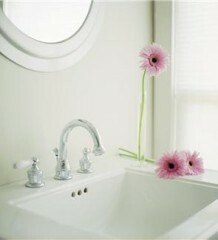 In many cases, they simply replace the old bath, toilet and sink for new ones which often look the same. This is often entirely unnecessary as baths, toilets and sinks can be made to look new simply by getting them re-enamelled. It is amazing how much re-enamelling can change a worn, rough or stained bath. If you are looking for a more modern aesthetic, think about buying new taps for the bath and sink and new handles and seat for the lavatory. Chloe Grayson has been offering advice about home improvements and accessories for over 15 years and has written for a wide range of websites and print media. She often writes about the kind of bathroom accessories UK suppliers can offer to customers who want to refresh the smallest room in the home.